It is not an easy task to manage a complex business process in today’s world. Due to the complexity of business processes, it is very difficult to finish the task in an allocated time. 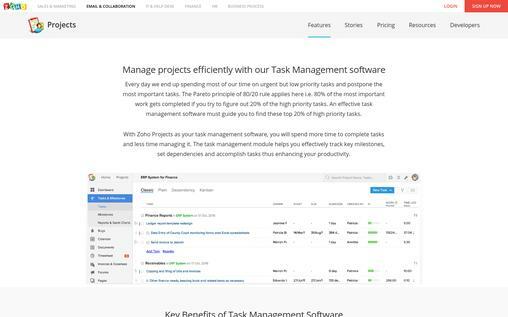 The task management software allows you to plan your projects, allocate the tasks to your team members, communicate with your team members in a real-time, and many more. There are many task management software with plenty of unique features to choose from. Are you confused about which task management software to choose? Your confusion will disappear once you go through the list of the 10 best task management software. 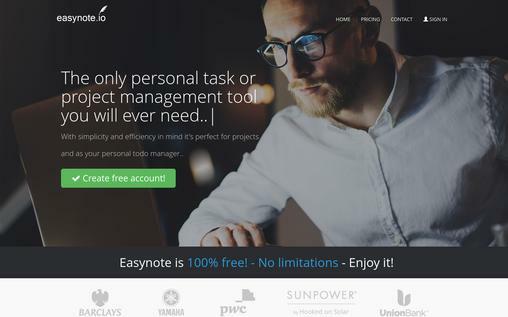 Easynote is a simple task management software with plenty of features to manage your projects. Easynote is trusted by a number of big companies like Yamaha, Barclays, Union Bank, and more. It works perfectly on your devices such as computers, tablets, and smartphones, which allows you to manage your task anytime. It has focused a lot on simplicity. It has a simple interface where you and your team can connect with each other, share the tasks, and track the progress. Easynote’s invitation feature allows you to invite the people, provide them with access, and allocate the task to them. The follow-up feature enables you to monitor the task, follow up with your team members, and comment on the task. The activity feed allows you to track the changes in to-do-list with an easy overview. The time tracking feature lets you select the deadline for the task to be finished. You will be notified by an automated email to keep you updated with the tasks at hand. Easynote is 100% free task management software. 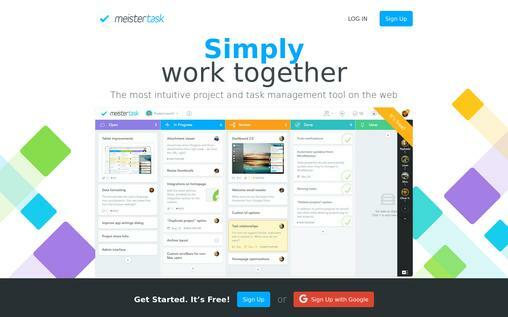 Meistertask is an intuitive task management software that offers a simple interface to get started easily. You can easily invite members, create tasks, assign tasks, and follow up with your team members regarding the progress of your project. You can download its free app, which is compatible with Windows, iPad, and Mac OS to stay updated with your task wherever you go. The online mind mapping app lets you brainstorm with your team members in a real-time, create a task, and complete it together. The instant communication platform lets you communicate with your team members, add checklist items, upload files, and more. You can integrate Meistertask with different applications like Zendesk, Slack, Google drive, and more. The file management feature of Meistertask allows you to integrate your account with any cloud service file storage service for better file management. The automation feature lets you configure automatic actions in your project. You can sign up and start using Meistertask for free, or you can choose the Pro package, which costs $9/user per month. 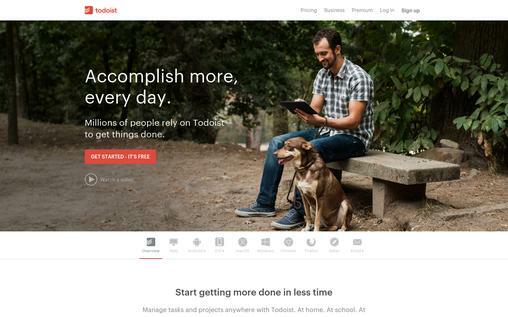 Todoist is full of incredible features, which allows you to manage your tasks easily. It allows you to manage your tasks from anywhere, online or offline through various platforms like mobile, web browsers, and more. You can collaborate with your friends and colleagues in real time by sharing unlimited tasks and working together on the shared goals and tasks. The simple interface provides you with the overall status of your tasks and groups. The subtasks feature allows you to break down the big project into smaller sub-tasks. The notification feature updates you with the recent progress through email or pushes notification. The intuitive date feature lets you set the due date for the task. The reminder tool reminds you via alert through SMS, email, and more. The multiple priorities let you set priority for each task. You can add details and comments on your assigned tasks, attach PDFs, photos, and more. 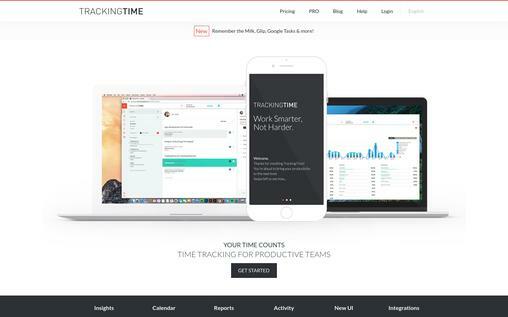 TrackingTime offers advanced tools to effectively manage your tasks. It is compatible with all major operating systems such as Windows, Linux, Android, and iOS. TrackingTime has a very clean and simple interface, which allows you to easily track the time, manage your team, and access its features. The task player allows you to track time in real-time on your task with just a single click. You can install the TrackingTime app on your smartphone too. TrackingTime allows you to integrate your account with apps like Basecamp, Asana, Gmail, Zapier, and more. The activity section lets you find, add, and view all your tasks. You can also insert notes to your time entries. The reporting tools let you create a timesheet, filter your data according to your requirements, and export it in PDF file. The calendar feature offers drag and drops time tracking and you can schedule repeating tasks to your team member. You can get insights to measure the performance of your team by showing time taken for task completion, work time, allocation of tasks, and more. The Basic Package is for free, and the starting paid package costs $4.99/user per month. 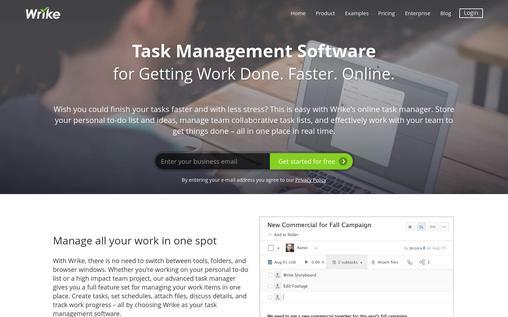 Wrike is an online task management software. It just takes a few minutes to create an account on Wrike and gets started. The repeated tasks can be automatically allocated to your team member, and it also sends an automatic reminder of the task needed to be completed. Moreover, you are also automatically notified about the task progress. You can integrate your account with Gmail, Outlook, and more to manage your task from your inbox. You can also access your account with your smartphones, which allows you to manage your task from anywhere. The task timer tool lets you track, log, and report the exact hours spent on the task. Wrike allows selective data sharing with your team. You can track the progress and reassign or reschedule the tasks too, if needed. The collaboration feature enables you to communicate and edit the tasks simultaneously with your team members in a real-time. You can get started with Wrike for free, and the paid package of Wrike starts from $9.80/user per month. Hitask keeps you under total control with the help of its advanced features. You can get the overview of the deadlines, calendar, tasks allocated, and teams in a single interface. The shared task list feature lets you create, assign, track, and leave comments on the allocated tasks. You are also reminded of the completed task right away. 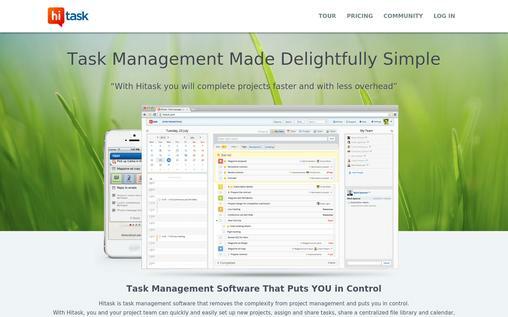 The smartphone app of Hitask allows you to manage your tasks from your smartphones. The file sharing feature enables you to attach documents on your assigned tasks. The time tracking feature automatically tracks the time spent on tasks, and export time log for accounting purpose. The powerful reporting tool generates the detailed report about your team’s performance and progress. The Personal Package in hitask is absolutely free, and the paid package starts with the Premium Package, which costs $4.17/month. 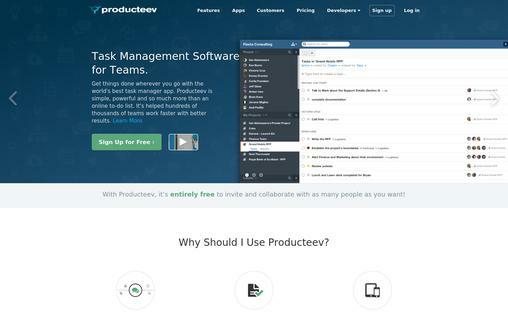 Producteev allows you to create, assign, organize, and track your projects. You can customize your producteev account with your own color and company logo. It is very easy to create, assign, prioritize, and comment on the tasks. The projects can be shared on the Producteev network, where all your team members can view the project in a simple interface. You can share the project, customize, and even add privacy to your projects. The subtasks feature lets you further break down the task to create a simple checklist. The deadlines setting feature allows you to add delivery date and time on the task. After you create a task you can assign it to one or multiple people on your team. You can bring any of your team member into the conversation by mentioning them in the comment. It allows you to attach files from your device or Dropbox to tasks. It keeps you updated by sending push-notification to your smartphone whenever an action occurs on a task related to you. The reminders tool allows you to set custom reminders and alerts for upcoming due dates. The audit trial allows you to see the full history of the task. You can choose from Free and PRO Package. The PRO Package costs $99/month. 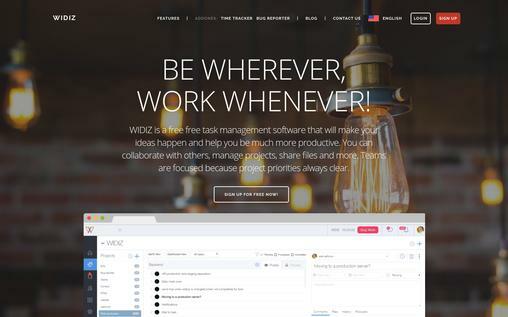 WIDIZ is task management software, which allows you to achieve your goals faster with the help of its amazing features. The easy interface of WIDIZ makes it easier to organize your projects by creating projects and tasks for your team. You can also simultaneously manage your private and public tasks on the single platform. You can create a free account, and use all its features for free. You can easily allocate tasks to the users, and add relevant followers to the tasks, which lets them to receive updates about the changes in the tasks. You can set permissions level with WIDIZ for providing only relevant access to your team members. The file management feature lets you share files, add comments on each task, and organize your files. The Gantt Charts allows you to visualize and manage your tasks to successfully complete it within the assigned deadlines. 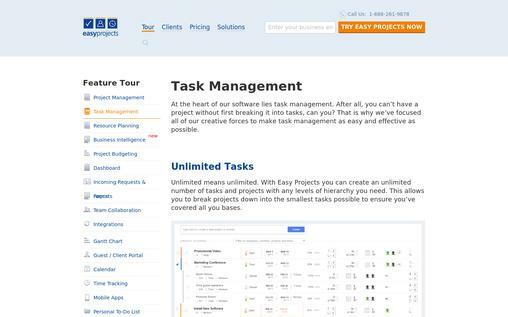 easyprojects contains a comprehensive set of tools to help you in managing your tasks. You can easily create unlimited tasks in the hierarchy with easyprojects. It is very easy to add, allocate and edit the tasks. You can just type @name with the task and deadlines, and easyprojects will automatically allocate tasks and deadline to the specific person. The resource planning tools in easyprojects allows optimal utilization of resources by providing you the detailed overview of the optimal capacity of your team members, which helps you to allocate the right amount of works at the right time to the right person in your team. The business intelligence feature provides you with the tools to analyze the important metrics in real time by showing you the performance with the help of charts, tables, diagram, and more. The easy financial tool lets you manage the budget by letting you set project billing, which includes data like hourly rate, project rate, and more; track the time and expenses; see the cost variance; and more. The team collaboration feature lets you communicate, add tasks, and share files in a real time. easyprojects lets you integrate your account with applications like QuickBooks, MS Excel, Gmail, Zendesk, and more. The time tracking feature allows you to easily track the tasks with a single entry, weekly submissions, and stopwatch function. easyprojets’ mobile app for iOS and Android allows you to manage the tasks from any time anywhere. The permission and security feature allows you to provide only limited access to your team member according to their needs. easyprojects offers 3 packages, and the price of the starting package is $12/user per month. ZOHO offers task management software, which will let you manage your tasks effectively. It lets you create, set priority, monitor, and assign tasks from a centralized platform. You can also convert emails into tasks, send email reminders, and access all its features from its centralized platform. You can create milestones, and it is automatically categorized in upcoming, completed, archived, and overdue by ZOHO. The timesheet interface allows all members to log their billing information. It automatically generates the invoice by utilizing this information. The task timer tool automatically records time, and it is logged in timesheet automatically. The subtasks feature lets you break down the task, and you can track it separately. The task reminders and duration feature provides timely email to remind you about important milestones, and you can set task durations in either days or hours depending upon your requirements. The task reports feature allows you to see a detailed view of tasks, milestones, and priority. You can also view tasks from different perspectives and the status. You can choose from Free, Express Premium, Premium, and Enterprise Packages. The paid package starts from $25/month. You must be excited after going through the amazing features of all task management software on the list. Now, it is the time to choose one from the list. Well, you can try multiple task management software, and select the best one for you. If you have a huge team, then it is better to choose one of the paid packages, but if you’re just starting out, then you can get started with the free one. It is necessary to analyze your needs and compare it with the features for selecting the best one.